A series is a measure field that is included in a chart. You can format a series in a variety of ways. For example, you can change the color of a series, add a trendline to a series, or change the appearance of markers on a series. You can access the full set of formatting options on the Series tab and Field tab. For more information, see Series Tab and Field Tab. You can also access a subset of frequently-used options by right-clicking a series element on a chart to open a menu of those options. Tip: The options that you see on the menu depend on the type of chart that you are creating. For example, the Series Type option would not appear on the menu for a pie chart, but it would appear for a bar, line, and area chart. For Instructions on how to open these dialog boxes, see the procedures in Using Series Properties. The Format Series dialog box contains options to format the fill and border of each series on a chart. Use the Fill tab to modify the color of a chart series. The Fill tab is shown in the following image. No fill. Select this option to remove the color from the series. Solid fill. Select this option to display the Color and Transparency options. Color. Click this icon to open the Color dialog box, where you can select a color for the series. Transparency. Move the slider to make the bands opaque (0%) or transparent (100%). The default is 0%. Gradient fill. 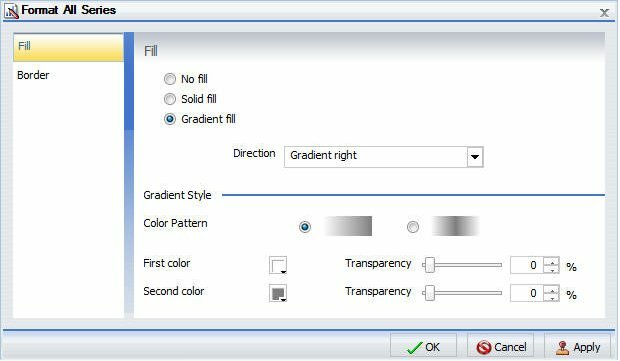 Select this option to display the direction of the gradient, the color pattern of the gradient, and the degrees of transparency for the two colors that make up the gradient. A gradient is a smooth color transition or blending of one color to another. The number of colors to use in a gradient is defined by the stop or pin elements. Use the Border tab to specify a border for a chart series. The Border tab is shown in the following image. Show Border Color. Select this option to show a border color around each series. Border Color. Click this icon to open the Color dialog box, where you can select a color for the border. The Enter Title dialog box contains a text field in which you can type the title for a series on a chart. Click OK and the title appears on the chart. The Traffic Light Condition dialog box contains fields for adding new conditional styling or modifying existing conditional styling by applying a traffic light color to the selected field. The Traffic Light Condition dialog box is shown in the following image. The Traffic Light Condition dialog box contains the following fields. Type. Opens a drop-down menu of the following values Constant and Field. Select Constant to enter a constant value. Select Field to open a visual display of the fields in your data source. Value: Enables you to specify a value based on the Type that you select. Note: If you are creating a Traffic Light condition on a full date field, the Value field will have a calendar icon adjacent to it. You can use this icon to select a date using a calendar control. The visual display of fields is shown in the following image. Selected Condition. Click this icon to select a condition to work on. New. Creates a new rule. Color. Opens the Color dialog box. When you right-click a series on a chart, a menu of options opens. The menu contains options that are available on the Field and Series tabs. The menu options are described in the following table. The table provides links to the sections of this document in which those options are also discussed. 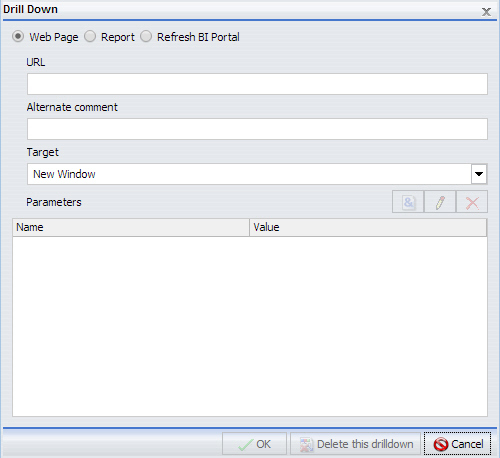 Enables you to create or modify a WHERE statement, using the Filter dialog box. With a WHERE statement, you select only the data that you want to display, and exclude unwanted data. For information on filtering your data, see Data Tab and Field Tab. Enables you to sort the series in either ascending or descending order. Controls the display of the selected series (field) on a chart. The value Hide suppresses the display of the series, and the default value Show displays the series. For instructions, see How to Hide a Field in a Series. Enables you to edit the title of the selected series. In the Edit Title dialog box, type the new title in the Enter Title field, and click OK.
For instructions, see How to Change the Title of a Series. Changes the chart type of the selected series to bar, line, or area. The option None (default) returns the series to the chart type that was in effect before you changed it. This option applies to bar, line, and area chart types only. For instructions, see How to Change the Type of a Series. Enables you to specify the color of the selected series, using the Color dialog box. For more information, see Color Dialog Box. Opens the Format Series dialog box. For more information, see Format Series Dialog Box. Controls the display of data labels (values) on the selected series. The default value Hide suppresses the display of labels, and the value Show displays labels. This option does not apply to the gauge chart type. For instructions, see How to Show and Hide Data Labels. Controls how color is applied to a series (measure field) on a chart. The possible settings are By Series (default) and By Group. For example, assume that there is only one series on a sample bar chart. The By Series setting applies the same color to all the bars in the series. The By Group setting applies a different color to each bar. For instructions, see How to Control the Color Mode. Draws a line on a chart to indicate a statistical trend. This option does not apply to the pie, funnel, 3D, gauge, or stock chart type. For an example of a chart with a trendline, see How to Add a Trendline. Contains the Aggregation Functions, Traffic Light Conditions, and Missing options. Aggregation Functions assign an aggregation value to a numeric measure field in a report. For instructions, see How to Display Aggregations on Measure Data. Traffic Light Conditions enables you to specify the color of numeric measure fields in the output, depending on conditions that you set. You can use the Traffic Light Condition dialog box to specify the conditions and colors. For instructions, see How to Apply Traffic Light Conditions With Drill-Down to a Numeric Measure Field (By Constant) and How to Apply Traffic Light Conditions With Drill-Down to a Numeric Measure Field (By Field). The Missing option allows you to show or hide fields with no value. Removes the selected series from the report and updates the Live Preview accordingly. The following sections contain procedures for customizing a series. The procedures are organized by the tab and group in which their associated options appear on the ribbon. The Select group contains a drop-down menu for selecting a specific measure field to which to apply one or more of the options that are available in the Series tab. On the Series tab, in the Select group drop-down menu, select the Series that you want to customize. The Series appears in the drop-down menu field. The Style group enables you to apply styling options to the series indicated in the Select group. Ribbon: On the Series tab, in the Style group, click Style. Right-Click Menu: Right-click a series on the chart, and select More Style Options. The Format Series dialog box opens. Use the fill and border options to format the series. For more information, see Format Series Dialog Box. The Format Series dialog box closes. The series fill and border are formatted accordingly. Click Run to generate the report. Create a bar, line, or area chart. Ribbon: On the Series tab, in the Properties group, open the Type drop-down menu. Right-Click Menu: Right-click a series on the chart, and point to Series Type. Select the type that you want the series to become. The chart contains the new series type. A trendline is a line that is drawn over the plot area of a chart to show the pattern of the data points. The pattern reveals a statistical trend. Note: Linear regression trendlines are not available for bubble charts in HTML5. Ribbon: On the Series tab, in the Properties group, open the Trendline drop-down menu. Right-Click Menu: Right-click a series on the chart, and point to Add Trendline. Select the type of trendline that you want to display. The trendline appears on the chart. Optionally, to display the mathematical equation for the selected trendline option, on the Series tab, in the Properties group, click Equation. The following image shows a trendline that appears with the Linear option. The Line group contains the options for formatting chart lines and line markers. Create a line chart. The following image shows a chart without the smooth line effect. Select a series on the line chart. On the Series tab, in the Line group, click Smooth Line. The Smooth Line effect is applied to the series, as shown in the following image. Lines appear between markers by default, as shown in the following image. On the Series tab, in the Series Group drop-down menu, select the series that you want to hide. In the Line Group, click Connect Lines. The series line between the markers disappears, as shown in the following image. To make the series line reappear, click Connect Lines again. Markers are used to display points of data on a line chart. They are also used in the legend to identify the data that is on the chart. The different marker shapes distinguish one series from another. On the Series tab, in the Line group, click Marker to open a drop-down menu of options. The following image shows a square marker for Dollar Sales and a circle marker for Quantity. The Pie group contains options for expanding and hiding pie slices. The following image shows a basic pie chart before its slices are expanded. All Series expands all slices out from the center of the pie. A specific series expands that particular slice out from the center of the pie. In the Pie group, click Expand. The following image shows a pie chart with all slices expanded. On the Series tab, in the Select group, from the drop-down menu, select the series that you want to hide. Then, in the Pie group, click Hide. The following image shows a pie chart with a slice hidden. The Display group contains the Reverse Order command to reverse the order of a series when All Series is selected in the Select group. On the Series tab, in the Display group, click Reverse Order. The order of the series is reversed. The following image shows a vertical bar chart. The following image shows the same data with the series in reverse order. The Filter group contains various filtering options, which can be applied to a selected field. Select a series on the chart. Ribbon: On the Field tab, in the Filter group, click Filter. Right-Click Menu: Right-click a series, and select Filter Values. The Filter dialog box opens. For more information, see Filter Group. Select values for values and prompts. The series values are filtered. The Sort group contains options for sorting the fields in your chart. Ribbon: On the Field tab, in the Sort Group, click Up to sort the series values from smallest to largest, or click Down to sort the series values from largest to smallest. Right-Click Menu: Right click a series on the chart, and point to Sort, and then Sort again. Click Ascending to sort the series values from smallest to largest, or click Descending to sort the series values from largest to smallest. Select Limit to open a list of values to display for a sort group. The chart appears with the series sorted accordingly. For more information, see Sort Group. The following image shows a vertical bar chart before sorting is applied. The following image shows the same data sorted in descending (highest to lowest) order. The following image shows the same data sorted in ascending (lowest to highest) order. The Display group contains additional options for controlling the display of a field (for example, hiding a field). Select the field in the Query pane. Right-click the field in the chart. Ribbon: Select the field in the Query pane or by right-clicking it in the chart. On the Field tab, in the Display group, click Hide Field. Click Hide Field again to make the series reappear. Right-Click Menu: Right-click a series in the Query pane, or in the chart, point to Visibility, and then click Hide. Right-click the same series, point to Visibility, and then click Show to make the series reappear. The following image shows a vertical bar chart with each of the series shown. The following image shows the same data with the Price field hidden. You can display numeric measure data using a variety of aggregation values. For more information, see Display Group. Ribbon: On the Field tab, in the Display group, click Aggregation. Right-Click Menu: Right-click a series, point to More, and then Aggregation Functions. The aggregation function is applied to the series. Note: If you change the Measure (Sum) field container in the Query Design pane from Sum to Print, Count, or List, the change overrides all assigned aggregation values. The following image shows a vertical bar chart without any aggregation values applied. The following image shows the same data with the aggregation value of Average (AVE.) applied to Price, and the aggregation value of Maximum (MAX.) applied to revenue. Ribbon: In the Query pane, select a field, and then on the Field tab, in the Display group, click Traffic Lights. Right-Click Menu: Right-click a series on the chart, point to More, and then select Traffic Light Conditions. The Traffic Light Condition dialog box opens. For more information, see Traffic Light Condition Dialog Box. In the Type dialog box, select Constant. From the Get Values drop-down menu, select one of the following values All, First, Last, Minimum, Maximum, From File. The value that you select appears in the Get Values field. The value that you selected appears in the field to the right of the operator drop-down menu. The following image shows a vertical chart without traffic light conditions. The following image shows the same vertical chart with traffic light conditions applied. In this example, the condition was set to display the revenue series in red when the Revenue series exceeds the value of 14399.46. Right-Click Menu: Right-click a series on your chart, point to More, and then select Traffic Light Conditions. In the field to the right of the operator drop-down menu, click the arrow for the Type drop-down menu. In the Type dialog box, select Field. View fields in business order. Select from the following options: Title, Description, Name, or Alias. View fields in a sortable grid. Select from the following options: Name, Title, Alias, Format, Segment, Filename, Description, or Reference. View the hierarchical structure of the data. Select from the following options: Title, Description, Name, or Alias. The field that you selected appears in the field to the right of the operator drop-down menu. Right-Click Menu: Right-click a series on the chart, and select Change Title. Query Pane: Right-click a series, and select Change Title. The Edit Title dialog box opens. In the Enter Title field, type the new name for the series. The series has a new title. The following image shows a vertical bar chart with a Price series and a Revenue series. In the following image, Annual Revenue has replaced Revenue as the series title. When you create a single-series chart, all series groups appear in the same color. To use a different color for each group, set the color mode to By Group. The following image shows a single-series chart with all series groups in the same color. Right-click a series on the chart, point to Color Mode, and then select By Group. A different color is applied to each group in the series. To return to the default display of the series in one color, right-click the series, point to Color Mode, and then select By Series. The following image shows a single-series chart with a different color applies to each group in the series. Right-click a series on the chart, and select Delete.